The Northern Virginia data center market experienced unprecedented growth over the past twelve months. Over 111 MW were added in commissioned power capacity (including of pre-leasing), and a number of projects are currently under development in the area. DuPont Fabros continues to bet big in Northern Virginia. DFT is expanding in Ashburn. The data center expansion gives DuPont a study stream of capacity to be delivered over the next several quarters. ACC7 Phase III (11.5 MW/68k SF) has now been delivered and is currently 100% leased. In addition to Phase III, DFT is under construction with ACC7 Phase IV, which is 7.8 MW and 52k SF (49% leased), and ACC9 Phase I, which is 14.4 MW and 90k SF. ACC9 is anticipated to be delivered Q2 2017. They also own land for additional development to house ACC8, ACC10, and ACC11. Activity continues at Digital Realty’s Ashburn campus. Digital Realty wisely purchased 126 acres within close proximity to its existing Ashburn campus in Q4 2015 to accommodate future expansion. On their current campus, they are actively in development with Building J, a 15.2 MW facility at full build. The only remaining building to be built on the campus is Building H, with 14.4 MW of planned capacity. CoreSite announces large expansion. In Q3 2016, CoreSite announced the purchase of a 21-acre site they will use to invest up to $500M in future expansion. The site will hold a 48,000 SF data center, a 92,000 SF data center shell, and a 92,000 SF building to accommodate the infrastructure needed to support the campus. CoreSite currently operates two data centers in the Northern Virginia region, VA1 and VA2. CyrusOne buys land for expansion. In Q3 2016, CyrusOne purchased a fully pre-leased shell to be developed into a 12 MW facility for an unnamed cloud provider. The rapid growth in Northern Virginia has led to a rush for vacant data center capacity. In addition, CyrusOne purchased a 40-acre parcel of land in Ashburn with plans to invest over $1 billion during the project’s entirety. CloudHQ signs large transaction. CloudHQ is a data center provider led by former DuPont Fabros CEO, Houssein Fateh. The company began in late 2015, and has purchased a site and is under construction with a 43.8 MW data center in Manassas, VA. The first 35 MW was leased to one end user, and the additional 8.8 MW will be leased to additional tenants. COPT purchases land for additional data center development. COPT created the Bethlehem Technology Park by purchasing 62-acres of land in Manassas, VA. Plans are to build two data center shells on the site; one 152,000 SF data center to be delivered in Q4 2016, and another 215,000 SF shell to be delivered Q2 2017. RagingWire VA2 facility is open in NOVA. The provider had their ribbon cutting in April for the new 140,000 SF, 14 MW Ashburn data center. The facility will have seven data hall vaults and is RagingWire’s second in the market. RagingWire is also under development on a 73 acre site in close proximity, with plans to produce a two million SF turnkey and build-to-suit campus. Iron Mountain to develop three-building campus. The 83-acre, three-building Manassas campus will be built out over several years and is within close proximity to a new substation. Iron Mountain intends to market their services toward corporate and government customers and plans to build 375,000 SF. Sabey breaks ground on new Northern Virginia data center. In May, Sabey began construction on their 38-acre campus in Ashburn, with eventual plans to deliver over 900,000 SF. The first phase is fast-tracked with anticipated delivery in Q4 2016. The campus is Sabey’s first venture into the Northern Virginia market. DBT expanding in NOVA. In May, DBT had two notable acquisitions; one property with a 130,000 SF shell with room to add another 200,000 SF building, and a 24-acre plot of land in Ashburn where DBT plans on building a 600,000 SF data center. Infomart under construction. 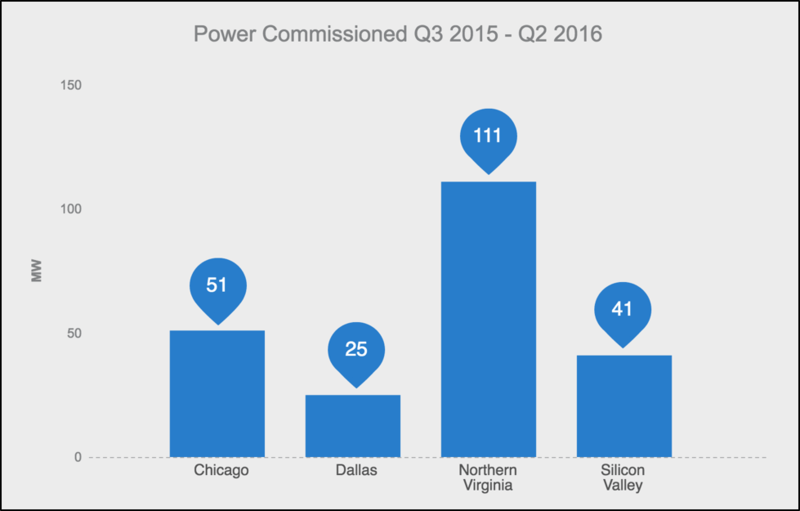 Infomart continues construction at the former AOL facility, with anticipated delivery of 5+MW of commissioned power in Q4 2016 – Q1 2017. Data center growth in Northern Virginia is in an unprecedented point currently. The increased competition is creating an aggressive environment in an area where data center users are comfortable expanding. The current cycle of growth and improvement is a major factor has helped Northern Virginia become the largest colocation data center market in the world.